If you loved my traditional almost fat-free cheesecake recipe, you're in for a real treat with this variation! For starters, I used chocolate gram crackers for the crust. I pulsed them in my food processor until they were a consistency similar to bread crumbs. Then mixed the gram crack crumbs with about 8 tbsp of unsweetened applesauce. I poured the batter into my greased pie pan and baked it at 350F for 8 minutes. It smelled so heavenly. 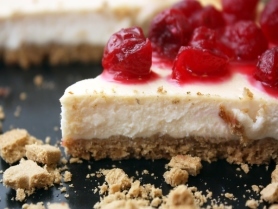 Like the original, this cheesecake is almost fat-free and is so unbelievably good. My parents and omni friend Blyth all gave it a two thumbs up and Scott and I... well, we're thankful for the leftovers to say the least! Now pardon me, I have cheesecake waiting to be eaten! Nom. Nom. Nom. Vegan cheesecake became a Christmas tradition in my family after my parents went plant-based. This recipe is more decadent than my other recipes and uses ingredients I normally wouldn't...except during the holidays! You'll also need my Graham Cracker Crust recipe.